The Asian + Australian-Asian gang. I was having a light flu, so pardon Me for wearing a shirt. Also... hahaha... yes I was too shy to show people my skininess. Some people from Australia in Australia ... except Me ! The average muscular boys... but aren't they look cool here ? The ladies trying to show something too ...sadly ended up like an Australian-style of lesbianism dancing. "Mummy mummy, I was so horny till my underwear dropped !" Wow... close your eyes, girls !!! A French kiss of more than 3 minutes ... and from a newly found couple ? Good luck mannn. 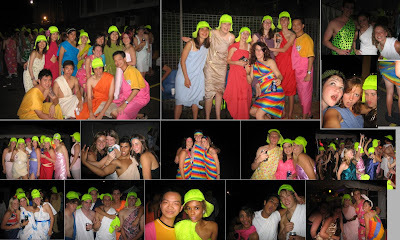 Tags: Patchay-Blogspot, Emmanuel College, toga party and toga. Yo Boss! its considered normal for de guai los here. Drink Drink Dance Dance ! See ya around!